The old primary school in the village of Nerokourou, just outside of Chania, Crete, was open to students between 1930 and 2000. When the new and much larger primary opened, 100 metres up the hill, Headteacher Dimitris Kartsakis and his wife Maria Drakaki wanted to keep the original school as an educational tool in its own right. With teaching materials, school bags and tunics from the 1940s and 50s, curricula, registers with students’ marks, maps, restored desks and seating, clippers for cutting the hair of children with lice, the Museum of School Life opened in 2006. Mr Kartsakis and Ms Drakaki had the idea, did the work and continue to act as guardians for the museum but it was a community effort as well. People from the village offered up their own items and those of their children. There are school-leaving certificates from the middle of the 20th century and Mr Kartsakis’s father’s 1st form schoolbag is there too – hand-woven in bright colours at some point in the early 1940s. It is the closest of the three in this image. The room is packed full of teaching resources. In fact, if you wanted, you could go in there tomorrow and teach a class. There’s a cane for discipline on the table but also a list of printed rules from the Ministry of Education encouraging students to love their teacher and each other. There are wooden blocks, cones and pyramids of different sizes made by now-aging students for geometry classes, small musical instruments, weights and tools to improve dexterity and coordination, a large, raised sandpit for experimenting with geological forms. 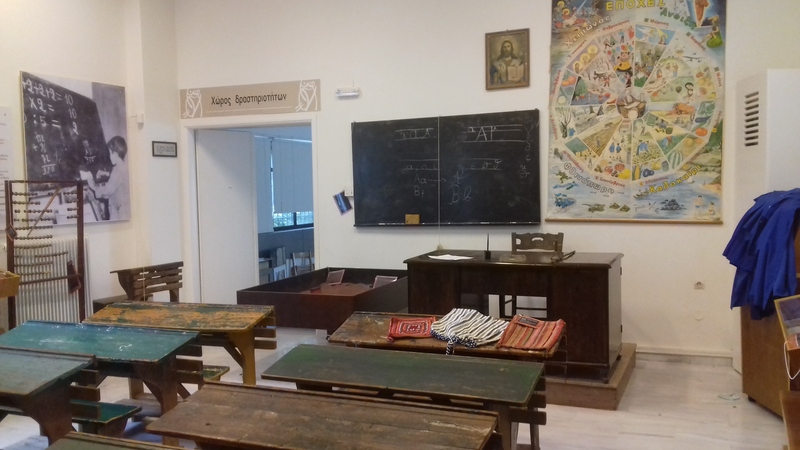 As teacher you would sit on a raised plinth with an image of Christ behind you, by the blackboard, and the heros of the Greek Revolution high up around the walls. Mr Kartsakis – the headteacher of Nerokourou Primary School and founder of the Museum of School Life – and Ms Pramateftaki, also a teacher at the school whose excellent English was a great help in understanding some of the exhibits. The room I have described is one of three classrooms (each roughly 6×8 metres and perhaps 5 metres high). This is the only one still set up as a classroom (the arrangement, desks and tables as it would have been from the 1930s until the 1960s). Another is now used by a cultural organisation for art classes and the third holds a collection of books, displays and other teaching materials. The display for this month (with an information screen behind it showing the photograph of the man who made it) is a perfectly working, hand-cranked model of the solar system. The various orbits are aligned by an array of cogs and driven by a bicycle chain connecting them to the handle – it’s beautiful and stupidly I forgot to take a photograph. There are overhead projectors and video cassette recorders which appear to be from the early 1980s, also on display. All of these objects: 70 years of teaching technologies and curricula, mark books, certificates, toys, clothes, musical instruments and so forth – all help to act as witnesses to the fact that so much of educational ‘hardware’ was tactile and visually present as part of the everyday life of the school. It’s stuff, it’s there, you can see it, be reminded of it, touch it. The physicality of it all is striking. In some ways, the museum reveals what is just as present in contemporary schools but more likely to go unnoticed because it exists in bits and bytes rather than things. This is not a lament – I’m very glad for digital technology – but I am also very happy that museums like this exist: as reminders of how much school and its procedures and activities is built and always will be on a web of materials, and personal and social histories that extend into the heart of a community that clearly cares for it. Thank you to Elizabeth Pramateftaki from Nerokourou Primary School who was an enormous help translating with excellent English. Together with his wife, Maria, Mr Kartsakis has created something very special indeed and I wish them the best of luck. Ireni from the Chania Tourist Office was extremely helpful with advice and information – thank you too.